Just when I’m thinking I should brush up on my cursive handwriting skills I hear that many schools aren’t even teaching it anymore. The downside of that brilliant move is that many young people cannot read written documents unless the words appear as type on a tablet, computer, smart phone or printed document. As a left-handed writer in grade two (in the 50s) I was one of the last kids in the class to advance from a fat “learner’s” pencil to the sleek yellow HP when it was time to begin learning cursive. Later, we all had to learn to write with ink using a fountain pen and each of us had a little bottle of ink in the round slot on our wooden desks for refilling our pens. 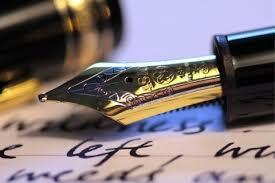 Writing with a fountain pen when you’re left-handed presents a number of challenges. 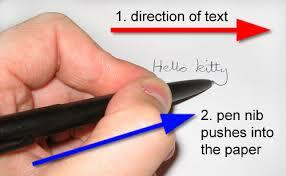 We were disciplined to hold our pens a certain way—index finger on the top of the barrel with thumb parallel on the bottom with the writing instrument resting on the knuckle of the second finger. And your arm was to be parallel to the side of the page. This regimen meant lefties dragged their hand over the wet ink, smearing their writing. The solution was to crook your arm 90 degrees so it was parallel to the top of the page (like Barack Obama and Prince William) which looked odd and resulted in teachers slamming your knuckles with a ruler until you did it properly. 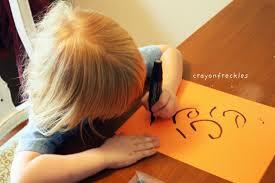 At least that was better than in my father’s day when lefties were forced to write with their right hand. As a left-handed writer, it’s always been difficult for me to execute the kind of gentle, sweeping curves I would like to achieve. This is the result of lefties having to “push” the pen across the page as opposed to the “drawing” across the page by righties. This may be difficult for right-handed writers to understand but Leonardo Da Vinci got it. 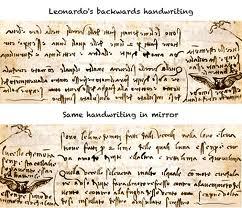 Leonardo was left-handed and found it infinitely easier to write backwards with his quill and ink—that is right to left on the page rather than left to right. This mirror-writing is relatively easy for lefties to execute because we get to “draw” the pen across the page, a more fluid operation than pushing. I remember writing to a pen-pal when I was in high school entirely in mirror-writing so she had to hold it up to a mirror to read it. I feel for ‘ya Leonardo. The look of beautiful cursive handwriting always fascinates me and I’ve only seen two people in recent years whose writing qualifies. There’s nothing quite as lovely as reading a note, a letter or a card written in liquid washable blue ink with an old-fashioned fountain pen. Ballpoints just don’t have the same cachet. As a result of using computer keyboards for most of my writing these days, my never-that-great handwriting is starting to resemble the scratchings of a demented illiterate. It’s the old, “if you don’t use it, you lose it”. For many years I’ve searched for the perfect pen for hand-written notes. Most fountain pens are too scratchy and are not leftie-friendly. Recently, after trying a number of different brands of gel and roller pens I purchased a nice little number at Staples by Pentel called EnerGel, Liquid Gel Ink plunger-style pen. And I love it. The washable blue colour and smooth delivery of the ink is as close as I can get to the fountain-pen look I like. Now all I have to do is get a lined exercise book and start practising my upper and lower case letters until they resemble the artistic cursive I would like to see. If no one comes along and cracks my knuckles with a ruler, I might just get better. Mrs. Thompson would be proud. Maybe I could even be trusted to use a grown-up pen. Does The Widow know more than she lets on? Such a good post! 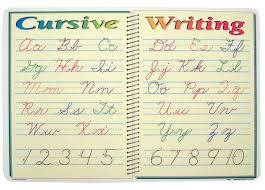 I recently read there are several states introducing and enacting laws to make teaching cursive handwriting mandatory. Seriously, I thought about future generations who would not be able to read the Constitution or other documents for lack of being able to decipher cursive.